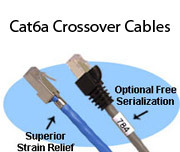 Stonewall offers Category6a cables in any length and a variety of colors. 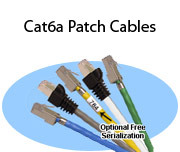 Each Cat6a patch cable is tested, serialized, and Certified 10 Gigabit. 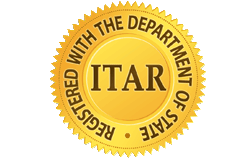 If the cable you need is not listed, call 800-525-3303. Cat6a Solid Cable is recommended for all horizontal runs, between wiring closets, and for lengths over 25 feet. Maximum recommended length is 100 meters (328 feet). It should not be flexed. Cat6a Stranded Cable is built to withstand the repeated flexing, common in PC to wallplate applications, without damage to inner conductors. Because of higher attenuation it is recommended for short runs of 25 feet or less.